Kansas City’s Old School Chopper Shop. When you ask people to describe a Chopper, no two response’s will be the same. There are no rules when it comes to creating a custom chopper. What’s cool? That’s for you to decide. With our years of experience we can help you make these decisions when you are at the beginning of your project or install the parts you will need to finish your chopper. Stop in and grab a cup of Death Wish Coffee and let’s start talking suicide shifters, ape hangers, bobber seats and custom wiring or anything else that helps you realize the bike of your dreams. A chopper is a type of custom motorcycle which emerged in California in the late 1950s. 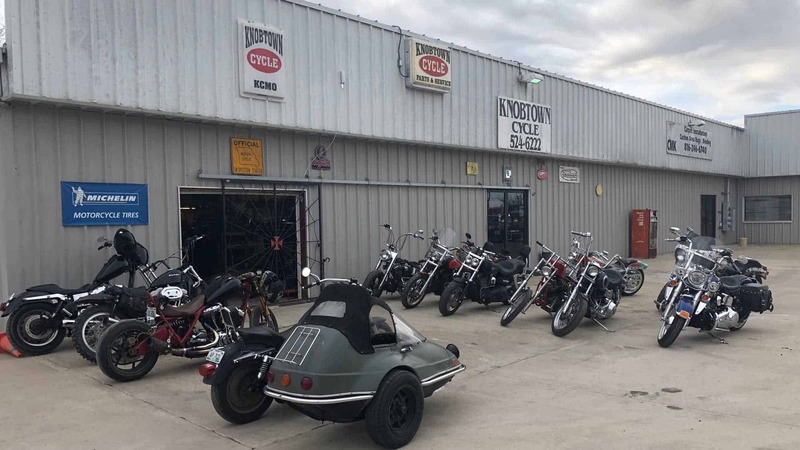 The chopper is perhaps the most extreme of all custom styles, often using radically modified steering angles and lengthened forks for a stretched-out appearance. They can be built from an original motorcycle which is modified (“chopped”) or built from scratch. Some of the characteristic features of choppers are long front ends with extended forks often coupled with an increased rake angle, hardtail frames (frames without rear suspension), very tall “ape hanger” or very short “drag” handlebars, lengthened or stretched frames, and larger than stock front wheels. The “sissy bar”, a set of tubes that connect the rear fender with the frame, and which are often extended several feet high, is a signature feature on many choppers. Perhaps the best known choppers are the two customized Harley-Davidsons, the “Captain America” and “Billy Bike”, seen in the 1969 film Easy Rider.